Women in Afghanistan are perhaps thought of as meek or downtrodden, hidden beneath their chadors and subjugated by men. These stereotypes ignore the fact that even though Afghanistan remains one of the worst places in the world to be a woman, Afghan women are making headway against gale force cultural winds. 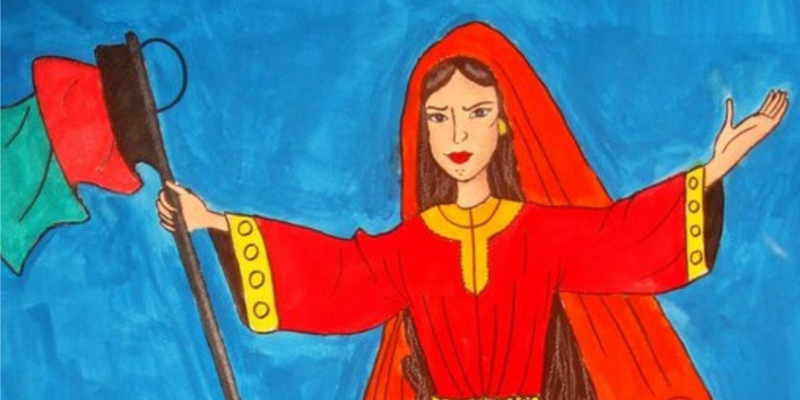 One of the most famous women of Afghanistan is the folk hero “Malalai of Maiwand,” the namesake of modern Pakistani heroine Malala Yousafzai. Her story is part of a rich oral tradition of courage and resistance against invaders that continues to be repeated to the day. During the 2nd Anglo-Afghan War (1878-1880), the British occupied parts of Afghanistan with troops from India. One force was centred on Kabul, while the other was garrisoned in Kandahar. The deposed Emir’s son, Ayub Khan, led a large Afghan army composed of irregular volunteers, mercenaries and ghazis (religious fighters). Although he would eventually be defeated, Ayub Khan managed to inflict a number of stunning feats on the British troops. One of these victories was at the Battle of Maiwand. On the morning of 27 July, 1880, a British force of two brigades commanded by Brigadier-General George Burrows clashed with Ayub Khan’s army, which was at least twice the size. The battlefield was constricted by the Maiwand pass, and for the first few hours was little more than an artillery duel. When the British guns on their left flank ran out of ammunition and withdraw, the troops on that flank collapsed, nearly leading to a rout. Ayub Khan held the field of victory, but at tremendous losses. Malalai’s father, a shepherd, and her fiancé, both joined the Army opposing the British that day. In some versions of the story, the day of the battle wa also her planned wedding day. She accompanied them on the battlefield, as did many Afghan women, to carry water and ammunition. The common picture of Afghan women today has them completely covered by a chador (or burqa), but this is a cultural rather than a religious requirement, and was not common at the time. Instead, Malalai and the other women present likely wore only a veil (or hijab). By God, someone is saving you as a symbol of shame! Such as would put to shame the rose in the garden! Encouraged by her words, Ayub Khan’s forces won the battle, though at a terrible cost. Amongst the dead was Malalai herself. Ayub Khan recognized her bravery, and ordered that she be buried with great ceremony in her native village on the edge of the battlefield. A shrine has grown up around her grave, which can be visited to this day.